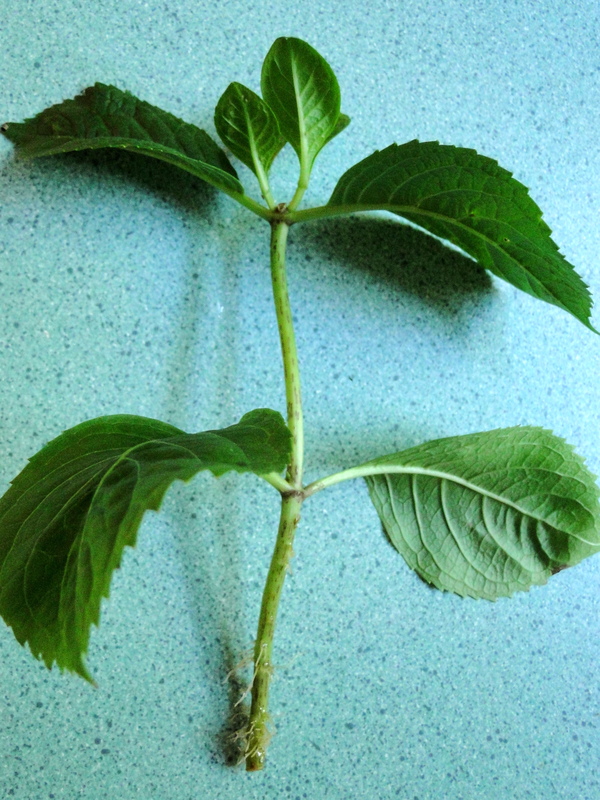 Hydrangea cutting with roots and new leaves. Propagating means starting a new shrub from an existing one. There are a couple of ways you can do this with hydrangea plants. Hydrangeas grow quite fast, and within a couple of years you will have a nice size addition to your landscape. I’ve had success with root layering, and hydrangeas, with their low hanging branches, are perfect for doing this. In fact if you check around the base of your plants that droop to the ground, you may find that a branch or two is already rooting itself into the soil. The mophead variety tends to have the low to the ground stems. I started a new plant by digging up the rooted stem and planting it in another area of the yard one Spring. I was renting the house, so I don’t know how it’s doing today, but by the time I moved, a beautiful new hydrangea shrub was gracing the front yard at no cost to the homeowner. Read how I did it, with pictures along the way, at my Wizzley page about Propagating Hydrangeas.